Pioneers in the industry, we offer truck gps tracking systems ais 140 standard, vehicle tracking system ais 140, gps tracking devices with ais 140, vts gps tracker ais 140, telematic system ais 140 and vehicle tracking system hardware ais 140 from India. GPS Fleet Truck Tracking Systems. The right GPS tracking system makestracking company vehicles simple and effective. ... Historically, Track Your Truck'sreporting system allows you to access the amount of detail needed to observe and correct unwanted trends and determine and lower fuel usage. Vehicle Tracking Systems are one such layer and are described by the NICB as “very effective” in helping police recover stolen vehicles. ... Vehicle tracking allows companies to quickly locate a field engineer and dispatch the closest one to meet a new customer request or provide site arrival information. Vehicle tracking. Some people use GPS Trackers to monitor activity of their ownvehicle, especially in the event of a vehicle being used by a friend or family member. GPS personal tracking devices are used in the care of the elderly and vulnerable. Tracking unauthorized Movements & Activities through Geo Fencing . Immobilizing them remotely and safely . Plugging leaks & Controlling Operational costs . nstallation of GPS Vehicle Tracking Systems today is a cumbersome process that requires highly trained engineers to cut wires in the Vehicle and connect them perfectly to ensure proper functioning of the system post installation This affects the Warranty of new vehicles . OBD2 Connected GPS VTS Systems are Plug and Play devices that can be operational within minutes of installation . They are non Invasive Systems that do not require any major surgery to be performed to the Vehicles existing wiring , hence do not compromise the Warranty of the Vehicle . 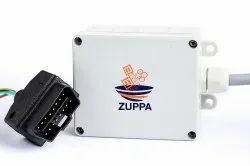 ZUPPA VeTrack is a fully Made In India OBD2 Compatible VTS Device that does Just that for you it’s a completely “ PLUG & PLAY “ VTS Device . Installation of GPS Vehicle Tracking Systems with RFID today is a cumbersome process that requires highly trained engineers to cut wires in the Vehicle and connect them perfectly to ensure proper functioning of the system post installation This affects the Warranty of new vehicles . 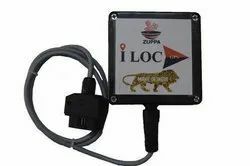 ZUPPA Ve Track is a fully Made In India OBD2 Compatible VTS Device that does Just that for you it’s a completely “ PLUG & PLAY “ VTS Device . GPS bus tracking, which is another form of asset tracking, is designed to improvebus operations and assist bus operations managers by having a sophisticated, user-friendly tool to help in managing, monitor and reporting of bus fleet information. Reduces the administrative burde. 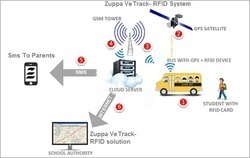 A combination of [RFID CARDS]READERS /GPS/ /GPRS/ allowus to track the loction movement , entry and exit of school childern automoted SMS to intimate parents about estimated time of arrivalof the bus. Real time location of school buses on Android /of the bus. Vehicle tracking. Some people use GPS Trackers to monitor activity of their own vehicle, especially in the event of a vehicle being used by a friend or family member. GPS personal tracking devices are used in the care of the elderly and vulnerable. AIS 140 Standed Vehicle tracking system. ... Modern vehicle tracking systems commonly use GPS or GLONASS technology for locating the vehicle, but other types of automatic vehicle location technology can also be used. Vehicle information can be viewed on electronic maps via the Internet or specialized software. The system makes use of HTML5 to display the vehicle locations on the map as well as any other info reported from the vehicles such as Ignition On or Off, Speeding etc, as the vehicles report to the server you see them moving on the map. You can display a single vehicle, all vehicles or if you have used the settings section to group your vehicles you can display just specific vehicles. Within the same section you can display all sorts of helpful info such as speed graphs, mileage for any period you choose, periods of inactivity and so much more. If there is something specific you want from the data please ask, the system probably does it. Ambulance Tracking System (ATS) is a specialized GPS tracking solution aimed at the efficient management of Ambulance fleet. This solution focus to make the ambulance available to a needy patient in the shortest possible time by redirecting the ambulance from a nearby location and in a shorter path, than the conventional way of sending the ambulance all the way from hospital to a critical spot. The most basic use of GPS tracking is to keep trackof where your vehicles are on the map. ... It also comes in handy in locating a stolen vehicle. Such a control of the fleet of vehicles is a key element to succeed in transportation and logistics business. 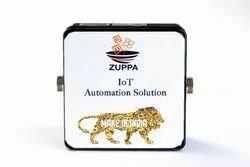 An internet of things gateway (IoT gateway) is a device that lets legacy industrial devices report data using the internet, participating in the internet of things concept, as well as enabling technologies or systems with disparate protocols interact with one another. School Bus Tracking. Our School Bus Tracking is specially designed for you to manage your fleet of buses effortlessly by transforming them into Smart Buses. This service facilitates administrative tasks that go along with ensuring the safety of a child. You stay aware of the whereabouts of children at all times.